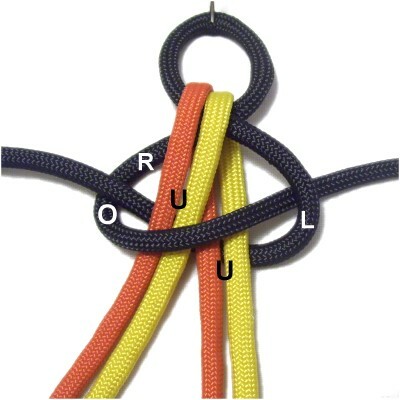 Description: The Spectral Line Bar is a series of Square knots tied in a unique way to produce a wavy design featuring three contrasting cords. The definition of Spectral Line is: An isolated bright or dark line in a uniform and continuous spectrum of light. This decorative knot definitely fits that definition in that it has a dark zigzag line running through the center of a bright wavelength pattern representing the light. 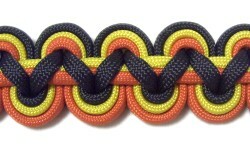 Paracord is a great material to use when practicing knots, but this design can be made with other materials. 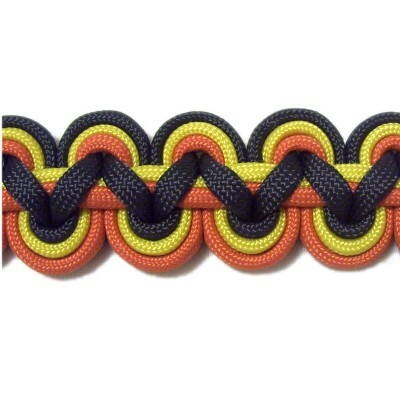 This decorative knot was found on the Fusion Knots website -- "Spectrally Clustered Solomon Bar"
The design described below has been slightly altered from the original. Click on the image or link to visit the site. 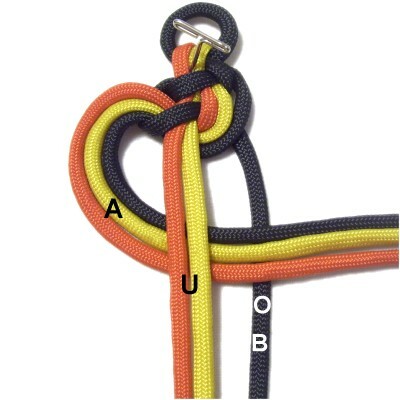 Check out the video gallery, which contains many interesting knot patterns and techniques. Preparation: To practice, cut one dark cord and two bright cords, each at least 60 inches long. Prepare the tips to prevent unraveling. 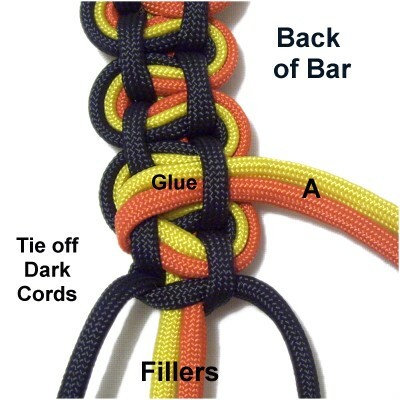 See Cord Preparation for details on how to prepare Paracord properly, if you plan to use it. Multiply the finished length by 10 if you are using the Spectral Line Bar in a project. Cut the cords to that length. 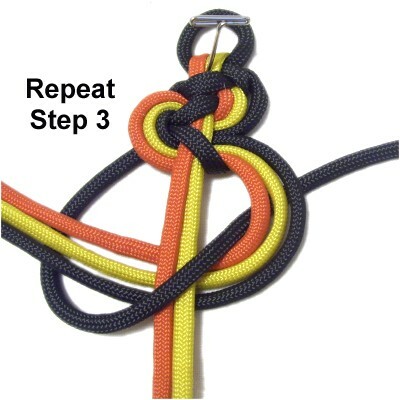 Step 1: Make a loop in the center of the dark cord, crossing left over right. Arrange the bright cords through it vertically, passing under the crossed area and over the crook. Step 1, continued: Adjust the bright cords so 1/3 of the length is in the portion closest to the back of the board (behind the crossed area). The remaining 2/3 is in the portion closest to the front of the board (in front of the crossed area). Fold the short portion of the bright cords forward, arranging them to the left of the long portion. 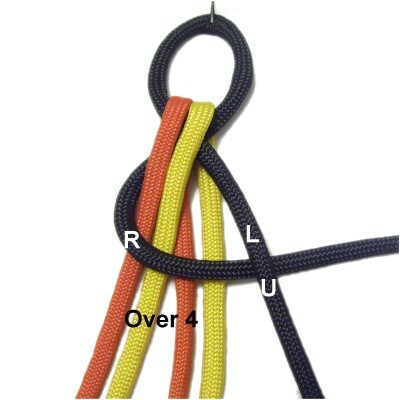 Step 2: Move the right half of the dark cord to the right, passing over the four bright cords. Pass it under the left half of the dark cord. Move the left half of the dark cord under the 4 bright cords, heading left. Pull it out on the left, passing it over the right half. 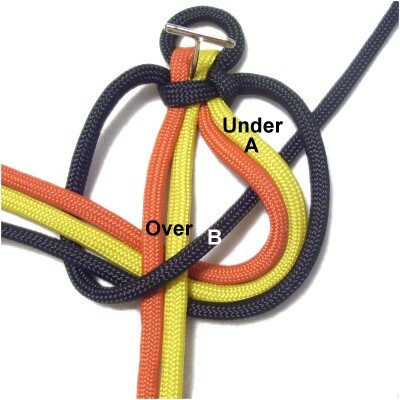 Adjust the size of the loop as you tighten the knot by pulling on both halves of the dark cord. Make sure the bright cords don't change position. Part A consist of three cords -- two bright and one dark, which are now on the right. 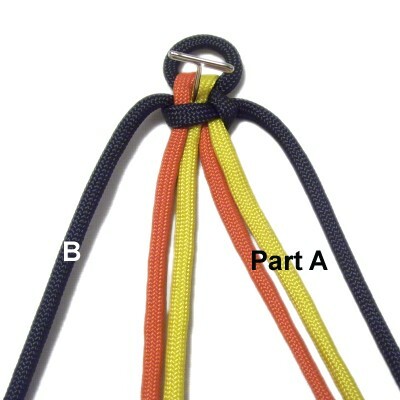 Part B is the single dark cord on the left. Step 3: Curve Part A to the left, passing under the two fillers cords horizontally. Arrange them over Part B. 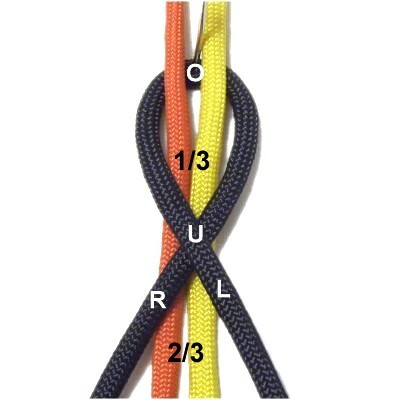 Make sure the 3-cord group is organized so they don't overlap each other. Move Part B over the fillers, heading right diagonally. Pass the cord under Part A (all 3 cords). Tighten gradually, making sure the cords in Part A stay in the same position. Designer's Tip: The first curved area for the Spectral Line Bar will be a little different than the other areas, since the black cord is slightly separated from the bright cords (Part A). 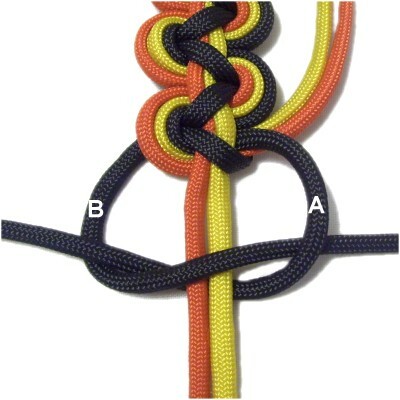 You may need to pull the black cord more than the bright cords in order to eliminate the gap. Step 4: Curve Part A to the right, passing them under the fillers and over Part B. Keep the cords in Part A organized and resting close together. Move Part B over the fillers and under Part A, heading left diagonally. Tighten the knot and make sure the fillers are straight. Step 5: Repeat step 3 to make the next knot for the Spectral Line Bar. Make sure the fillers are straight after tightening. Step 7: To continue, repeat steps 3 and 4 several times, until the Spectral Line Bar is the size you want. 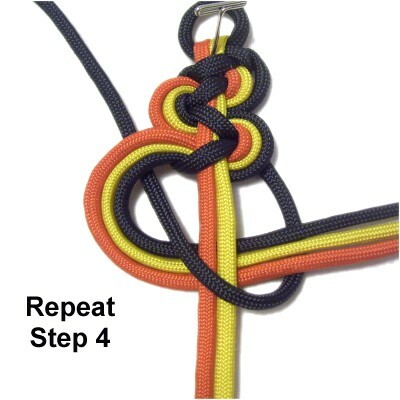 Make sure you stop on Step 4, with the loops on the left. Step 8: Tie the next knot with only the dark cords. Move cord B over the fillers, and under cord A, heading left. Move cord A under the fillers and over cord B, heading right. Tighten the knot FIRMLY. Step 9: Turn the Spectral Line Bar upside down. 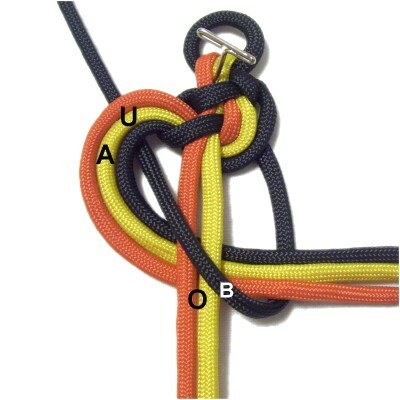 Move the two bright colored working cords (A) to the back, and pass them under one of the loop. Apply glue in the area between the loops. When the glue is dry, cut off the excess material. 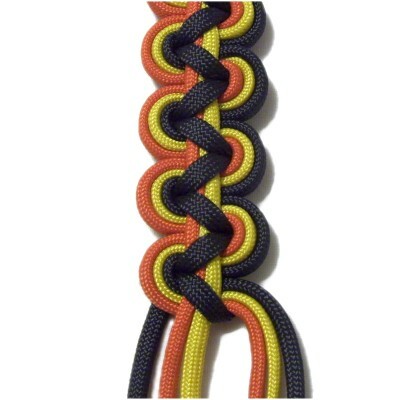 Step 9, continued: Tie off the dark cords with a FLAT finishing knot, such as a Barrel Knot. Apply glue prior to tightening. When it's dry, cut off the excess material. 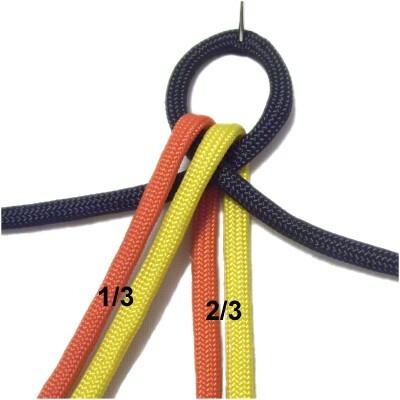 Melt the tips of these cords with a flame if using Paracord or nylon material. 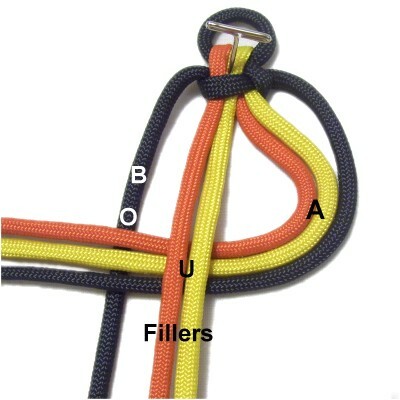 The remaining two bright cords were the fillers, so are long enough to make a button knot if you need a clasp. 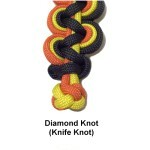 The Knife Knot, also called the Diamond Knot, is the best choice. It can be made with two cords. Click on the link or image to view the instructions. You could add a bead or button to the two filler cords, if you prefer. When using a button, pass the cords through it in opposite directions, then tie a finishing knot to secure it. You also have the option of finishing off these two cords like the others, in the back of the bar. Have any comments about the Spectral Line Bar? Contact Me.